Ra Ra Riot In Concert Ra Ra Riot's first two years of existence have been difficult, but the band just put out a beautifully polished and inspired debut, The Rhumb Line. Hear the group showcase the album in a full concert, webcast live from the Black Cat in Washington, D.C. It's been a rough but rewarding road for the Syracuse, N.Y., band Ra Ra Riot: In the two years since it formed, the group has endured a grueling tour schedule, inflated expectations from critics and the sudden death of drummer John Pike, one of the band's creative leaders. But Ra Ra Riot emerged from it all this year, wiser and more focused, with a beautifully polished and inspired debut, The Rhumb Line. Hear the group showcase the album in a full concert, webcast live from the Black Cat in Washington, D.C.
Ra Ra Riot got its start at Syracuse University in 2006, when a group of students decided to form a band around their shared love of danceable but unexpected and dramatic rock. Guitarist Milo Bonacci met violinist Rebecca Zeller in an electronic-music class, and together they pulled in cellist Alexandra Lawn, bassist Mathieu Santos and keyboardist Wesley Miles, with John Pike on drums. 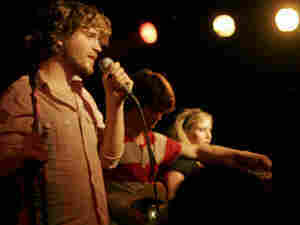 Ra Ra Riot found its voice quickly and launched what would become a seemingly endless tour of basement parties and clubs. Lawn and Zeller's dueling strings provided surprisingly rich textures, which helped set the band apart from other local acts — along with Miles' vocals, which suggest Morrissey crossed with Tom Verlaine. Sadly, the rapidly building momentum came to a sudden halt in June 2007, when Pike drowned off the coast near Fairhaven, Mass. He was just 23. Ra Ra Riot spent that summer mourning and regrouping. By the end of the year, the band was back in the studio with producer Ryan Hadlock (Gossip, Blonde Redhead, Islands) to record its full-length debut. It was a cathartic process. The Rhumb Line, named after a nautical term for traveling in a constant direction, became a memorial to Ra Ra Riot's late drummer. Pike is credited with writing the lyrics on a number of the tracks. The Rhumb Line is a joyful and life-affirming album. Sometimes playful, often intense, it's a bittersweet testament to life's unexpected jolts, in a world that can be at once beautiful and terrible. Regrouped and refocused, Ra Ra Riot hit the road again in support of The Rhumb Line earlier this year. The tour is expected to stretch well into 2009.